고려 청자의 전성기인 12세기경에 만들어진 청자주전자로 높이 24.4cm, 밑지름 10.3cm이다. 용의 머리와 물고기의 몸을 가진 특이한 형태의 동물을 형상화한 상형의 청자 주전자이다. 물을 따르는 부리는 용의 머리모양이고, 이빨과 지느러미, 꼬리 끝에는 백토(白土)를 발랐다. 얼굴의 털이나 지느러미들을 매우 섬세하게 표현하였다. 주전자 몸체에는 비늘이 도드라지게 표현되었고, 중앙부에는 앞뒤로 커다란 갈퀴모양의 옆지느러미가 묘사되었다. 손잡이는 연꽃줄기 모양으로 주전자의 몸체 위로 자연스럽게 늘어져 있고, 뚜껑은 물고기의 꼬리부분을 본떠서 만들었다. 전체적인 형태를 보면 기이하면서도 각 부위를 갖춘 한 마리의 상상의 동물모습을 하고 있다. 비취빛의 유약색과 더불어 지느러미와 꽃무늬에 나타난 세밀한 음각 표현은 능숙한 솜씨를 보여준다. 이 주전자는 상서로운 동물이나 식물을 모방해서 만든 상형청자 중에서도 매우 기발함을 보여주는 작품이다. This celadon ewer, with height of 24.4 centimeters and whose base diameter is 10.3 centimeters, was made around the 12th century. It features the shape of a mythical animal with a dragon head and the body of a fish. 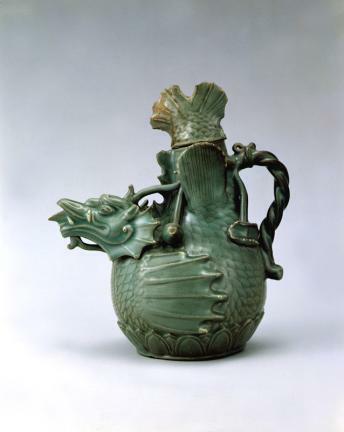 The ewer has a spout shaped like a dragon head, with its teeth, fins, and tail coated with white slip. Elaborate techniques of carving, engraving, and incising are used for the realistic rendering of the details – the mane around the neck, scales covering the entire body, and conspicuously large, wing-like pectoral fins. The handle is made in the shape of twisted lotus stalks and nicely attached at the back, and the lid, in the shape of fish tail complete with fins. The appearance of the ewer exhibits a fantastic, complete creature rendered based on wild imagination combined with masterful carving techniques and beautifully applied jade-blue glaze. 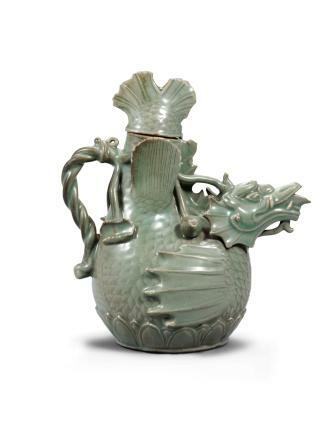 It is a unique example representing the great Goryeo celadon works conceived from the shapes of various auspicious creatures be they natural or imaginary.